Somehow the Patriots are in the Super Bowl AGAIN, but just because pretty much everyone in San Francisco is sick of hearing about Tom Brady and the New England dynasty doesn’t mean you should skip the game. After all, what could be better than rooting for the Rams to keep the Pats tied with the Niners at five Super Bowl rings apiece? Well… rooting for the Niners to get their sixth, but since that isn’t an option this year, we’ll have to take what we can get. Here are 17 places to watch the game, all of which have lots of TVs and adult beverages to consume, a bunch of which also serve food or allow you to bring your own in, and only one that is a Patriots bar. The Los Angeles Rams and the New England Patriots take the field at 3:30pm PST on Sunday, February 3. Watch at any of these bars or live CBS. Thanks to its 26 flat screen TVs and friendly bartenders, Bus Stop is Union Street’s most popular sports bar, so you can absolutely expect it to be crowded on Super Bowl Sunday. That being said, they’re throwing out specials which include Bud and Bud Light buckets (five beers) for $22, $6 shots of Espolon, and Tito’s drinks for $7.50. This laidback neighborhood bar has 19 HDTV’s, so there’s not a bad seat in the house. That being said, if you’re watching with a group, get there early so you can snag one of the comfy booths. During the game, they’ll be giving away authentic Guinness glasses when you buy a pint of the Irish stout (while supplies last). There’s no food available, but you can bring it in or get it delivered… we’re thinking pizza would be a good call. If you want to watch the game in a cozy cabin, but don’t want to brave the storm to drive to Tahoe, head to this Polk Street bar that has 12 TVs and a great whiskey selection. Drink specials are still TBD, but there’s a good chance they’ll involve Jameson and/or Fernet. There are only a few tickets left for the Super Bowl party at this North Beach sports bar, so call Brian at 415-577-1065 and get yours ASAP. You’ll be able to watch the game on the 9 HDTVs and enjoy a “fancy buffet” and open bar from one hour before kickoff until a winner has been determined. It’s $65 for dudes and $55 for girls, which seems strange in 2019 until you consider the fact that the gender wage gap is still very much a thing. 12 flat screen TVs, 24 beers on tap, and all of the nachos, hot dogs, corn dogs, and wings you could ever want… Grab a seat a table or the U-shaped bar. Should be relatively easy to get one since this is usually a Vikings bar and those poor fans just can’t catch a break. 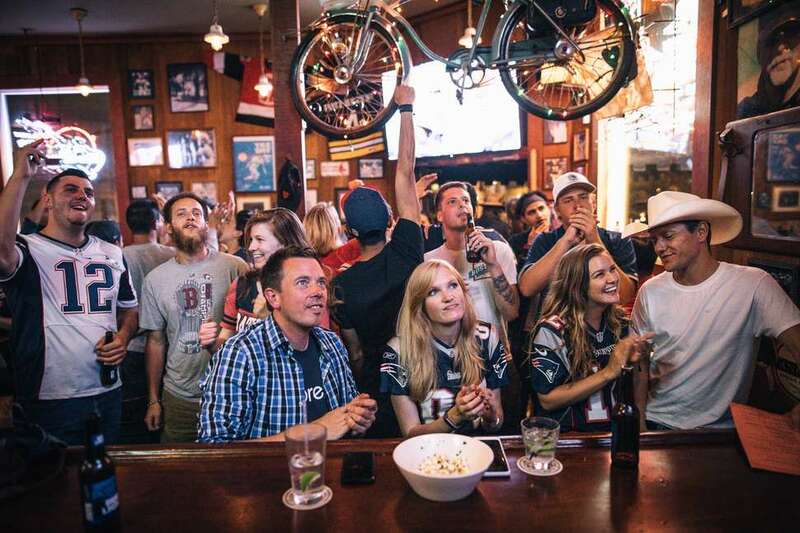 This Boston/Patriots bar is throwing what may very well be the only “Beat LA” party in all of San Francisco on Sunday, so if you’re rooting for the Rams, stay far, far away. The bar and kitchen, which will be serving New England-inspired food and drink specials, are opening up at 11am and seating is first-come, first-served, which pretty much means: Get there when it opens. Wherever you sit in this popular sports bar, there’s a good view of one of the 20+ TVs. 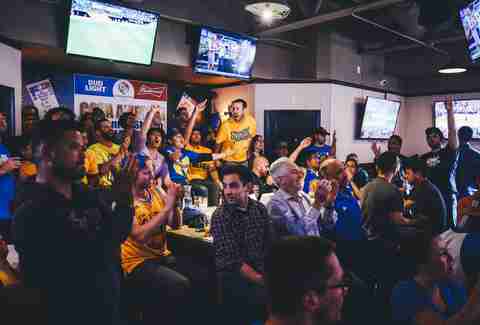 If you’re more into the commercials than the game, grab a seat in the front; the windows open onto Polk Street, so you can watch people who aren’t watching the game while the players are on the field. And, though it has yet to be determined, you can be sure there will be some kind of beer special. Kezar is pretty much everything you want in a sports bar. 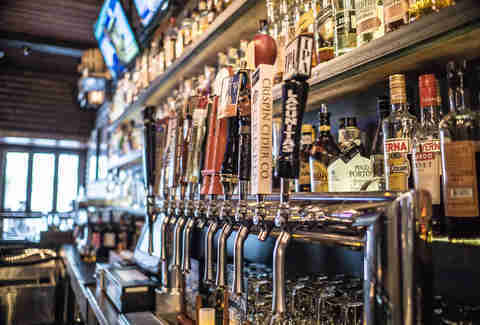 There are 20 TVs across two different rooms, 20 beers on tap (which you can also get by the pitcher), a full bar, and an extensive menu of pub food, including four kinds of wings, two kinds of nachos, three kinds of tacos, and a slew of burgers. Because of this you can expect tables to fill up fast, so get there early or send a friend to hold down the fort. Harry’s may be on Fillmore Street, but the crowd feels very Marina, which is a thing that will either make you want to go there or stay far away. No judgment either way. There are only six flat-screens, but you can see one from every seat in the house, and the surround sound is great. Plus, you can reserve a table; all you need to do is eat and drink $30 worth of food, beer, and cocktails, which shouldn’t be a problem at all. Bar seating is first-come, first-served. This gay sports bar is one of the best sports bars and makes you wish SF had more than just one gay sports bar. 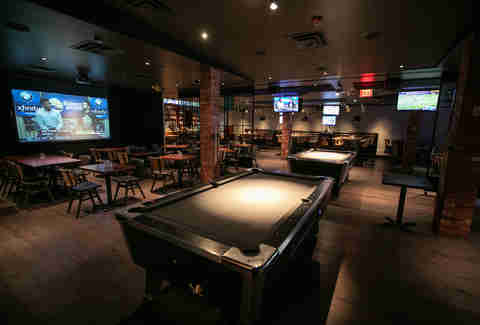 There are 26 flat screen TVs, benches made from gym bleachers, and top-notch food. Get the buffalo wings and the burger and then order an It’s-It for dessert. This Irish pub has 11 HDTVs and two projectors, plus a full bar and pub food. The crowd is friendly and can get a little loud, so if you need to hear the exact explanation for every flag or replay, this may not be the spot for you. However, if you’re into happy hour prices all day and free snacks, then you’ll be stoked. This massive bi-level sports bar has 22 flat screens, a full bar, and great food options, including wings, pizza, burgers, and even a couple of salads -- although who eats salad during the Super Bowl? The bar has been temporarily closed, but it WILL be open for the Super Bowl, and since the doors don’t open until 2pm, you don’t even have to get there that early to snag a seat. This spacious sports bar has 27 TVs, but it’s one of the most popular places in town to watch games, so you’re still going to need to get there early if you want a seat. The food menu is huge, so you’ll have your choice of wings, snacks, burgers, hot dogs, soup, salads, and there will be discounted bathtubs of beers. 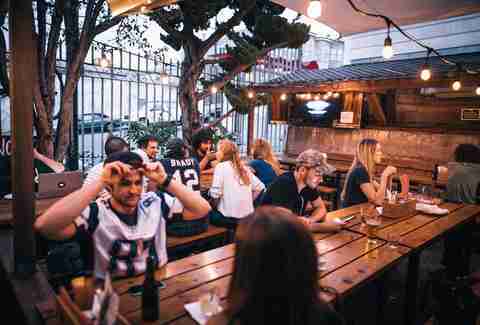 If you’re in Noe Valley, this is really your only option for bars to watch the Super Bowl, which is fine because there are 17 HDTVs, 40 beers on tap, and a three-level outdoor beer garden. Yancy’s feels like a comfy living room, if your living room is in the basement and filled with thrift store couches that smell like stale beer. But there are 14 TVs, five of which are over 40 inches and one of which is 69 inches (nice), so who really cares about the smell of stale beer? Not you, that’s who. Cash only. 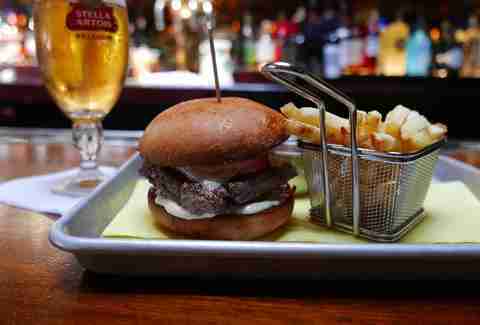 This sports bar flies a little under-the-radar because of its Mid-Market location, which means you’ll probably be able to get a seat pretty easily (doors open at 2pm), although if you’re worried: you can book a table. There are 17 screens with great viewing angles from every seat in the house, and there will be happy hour drink specials ($6 Jameson, $6 well drinks, $6 house red and white wine, $4 Modelo), and a special tailgate menu with dishes like a BBQ bacon cheeseburger, housemade chili, loaded hot dogs, and nachos. Still not convinced? Hazel has over 300 different whiskies. Exactly. This enormous craft brewery will be showing the game on 16 TVs throughout the restaurant (with sound, of course), and serving up $5 craft beers, cocktails, and apps. They’ll also be pouring a couple special releases and serving their full menu of SF-inspired pub fare. Doors open at noon. Check out the best bars to watch Super Bowl LII in Boston, Chicago, Las Vegas, Los Angeles, Minneapolis & Philadelphia.